Yuirail, Okinawa’s monorail, operates across 15 stops along an 18-kilometer route. Naha International Airport is the starting point on the southern end, while Shuri Castle is the northern end station. In between, there are 13 stations which offer shopping, sightseeing, or both. Today, we step onto the station platform at each destination, offering some insights about what to see and do. Some day-travelers drive to the airport and park, then criss-cross the city with the monorail before returning to retrieve the family wheels. The airport parking fees, which will total about ¥800 for the day, are worth not having to search for parking spots. Others will park near one of the other 14 stations, beginning their shopping and sightseeing treks from there. There are still parking problems to be dealt with, and parking costs are no cheaper than at the airport. 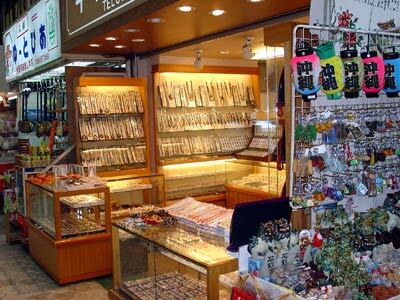 Naha International Airport’s domestic terminal is only 11 years old, and features a fair number of good shopping arcades, as well as branches of well known Okinawa department stores. It’s an ideal spot for the last minute purchases, particularly since there’s no requirement to tote them all over the city. First station out is Akamine, southernmost of the stations. This is Oroku’s developing commercial district, and has many business hotels. Look for the Traditional Arts and Crafts Center, a fresh look at traditional Okinawa materials including Tsuboya pottery, bingata fabric, Ryukyu laquerware and Ryukyu glass. Altec liquors and gift shop is nearby, along with Aoyama Clothing. Oroku Station is just up the road, and sits just outside Jusco, one of the island’s principal shopping malls. Gajanbira Park, overlooking Naha Harbor, is a short stroll from the station. The name originally referred to a place of many mosquitoes, but Gajanbira is now a great place to look out over the water. Onoyama-koen Station is alongside the sprawling Onoyama Park, one of the city’s largest. On the grounds are sports centers, tennis courts, a baseball stadium, Hokoku Shrine and Okinogu, one of the eight most important shrines of the Ryukyus, a swimming pool and athletic stadium, martial arts facilities and archery. Onoyama is the setting for dozens of festivals and sports events, including the Naha Marathon, and is simply a great place for a relaxing walk, ending up at the next station, Tsubogawa, across the Kokuba River. Tsubogawa is terminus for the tourism bus terminal, adjacent to the Naha Central Post Office, and has a quiet Tsubogawa Park. Manko Park is a seven-minute walk away, where bird watching along the tidelands is a pleasurable study in migratory bird habitats. Asahibashi Station is the hub to southern downtown Naha, stopping 50 meters from the Naha Bus Terminal. Also nearby is the Okinawa Prefecture Traditional Dance Theater and Naha Port Passenger Terminal. Kencho-mae, Miebashi and Makishi Stations are the southern, western and northern approaches to Naha’s international shopping and sightseeing district. The Kencho is Okinawa Prefecture’s governmental and economic center, and sits adjacent to Kokusai-dori. The annual Great Tug-of-War with the world’s largest rope is nearby at Kumoji intersection with Highway 58, while Kokusai, often called the miracle mile, is a three-minute walk from the Kencho-mae Station. 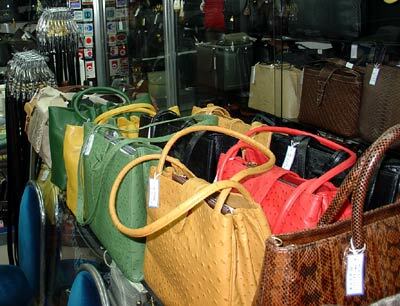 It’s 1.6 kilometers of shopping, shopping, sightseeing, and of course, shopping. There are also some good restaurants along the route. Before setting out, visit the Communications Museum on the 4th Floor of Palette Kumoji shopping center. The Naha Tourist Information Center is situated midway along the Kokusai route, just around the corner from Mitsukoshi Department Store. A five-minute walk the opposite direction brings you to Fukushuen Garden, built in recognition of sister city status with Fukushu, China. Matsuyama Park is five minutes further, opposite the gardens, featuring 36 sites recognizing the relationship between China and Okinawa. Five minutes further and you’re at Naminoue Beach, a free tourist beach with sugar white sands. Miebashi Station is the heartland of great downtown gourmet dining, only a few yards away from Kumoji. There’s also the Stone Gate of Sogenji Temple, a free excursion to a site built in the early 16th century to worship kings of the Ryukuan royal family. Close to Miebashi is Okiedori Street, a 500-meter-long shopping district which was the city’s original downtown. It dates to 1953, when it had a movie theater and a playhouse. Jikanji is a two-minute walk from the station, an area chock filled with secondhand bookstores, cafes and a variety of specialty shops. Makishi guards the northeastern end of Kokusai. Closeby is Agari-nu-Utaki, formerly a bullfighting ring, and Agari-nu-Ka, a public well. Ukinawa Utaki is also nearby, a place of prayer in the old Asato village, where it figured prominently in Okinawa history in 1713. Tsuboya Pottery Museum is a mere five-minute walk from the station, and offers a true introduction to Okinawa ceramics. Close to the museum is a pottery hall where works of 22 pottery studios are sold. Kilns used by the potters are also in the area, including one designated 2 1/2 years ago as a National Cultural Asset. 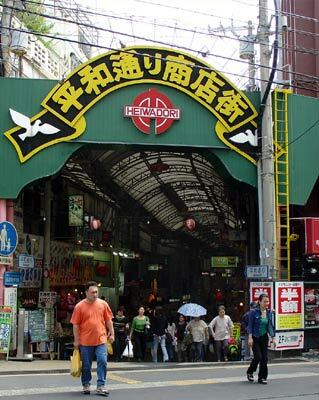 Away from downtown, and on to Asato Station, home to Sakaemachi Town Market and shops. The area was home to a women’s high school and a teacher’s school for women until World War II. Omoromachi is being called the new heart of Naha. More than a shopping zone, it represents the city’s growth. New government buildings, newspaper offices, hotels, and shopping malls share the landscape. Naha Main Place is popular, as is DutyFreeShopping Galleria, right outside the station. Furujima Station has little to entice riders to get off, unless you want to consider opening a business and want help from the City’s Business Incubation Office, or want to take the seven-minute stroll to the Prefecture Health Promotion Center to enjoy bubble baths, exercise and use of aerobic and other health equipment. The northern end of the Yuirail route pulls into Shiritsu Byoin-mae Station. Here you’ll find easy access to Naha City Hospital, with emergency services available around the clock, year around. Sueyoshi Park is a three-minute walk, and is free. It’s a chance to enjoy the forest, and the colorful flowers and botanicals, without leaving the city. Gibo Station is almost to the end, and entices riders to step away for a visit to the Okinawa Prefectural Museum, and then Torase Park. The museum has more than 43,000 artifacts on display, including all sorts of data on Shuri Castle. The museum is built on the original site of the Shuri royal family residence. The best is last, at least if you’re looking for history, adventure and culture all in one spot. Shuri Castle is Okinawa’s landmark, a World Heritage Sites Area, Base of the Shuri Royal Court, and the pride of the island. Plan at least a couple hours to absorb the history on these grounds, which include Shureimon Gate and Ryutan Pond, Benzaitendo Shrine, Shurikinjo Stone Pavement and more. And one final stop for adults. Shuri Distilleries are a ten-minute walk from the castle, and home to Okinawa awamori. Since 1667 the distilleries have been under management of the royal court, turning out the popular liquor under the names Zuizen, Sakimoto, Shikina and Miszuho. There are free tours and free tastings. You’ve done it, transversed the Yuirail! This being different from a hit-and-run mission, we recommend a day pass, which costs ¥800 and allows riders to get on and off multiple times.